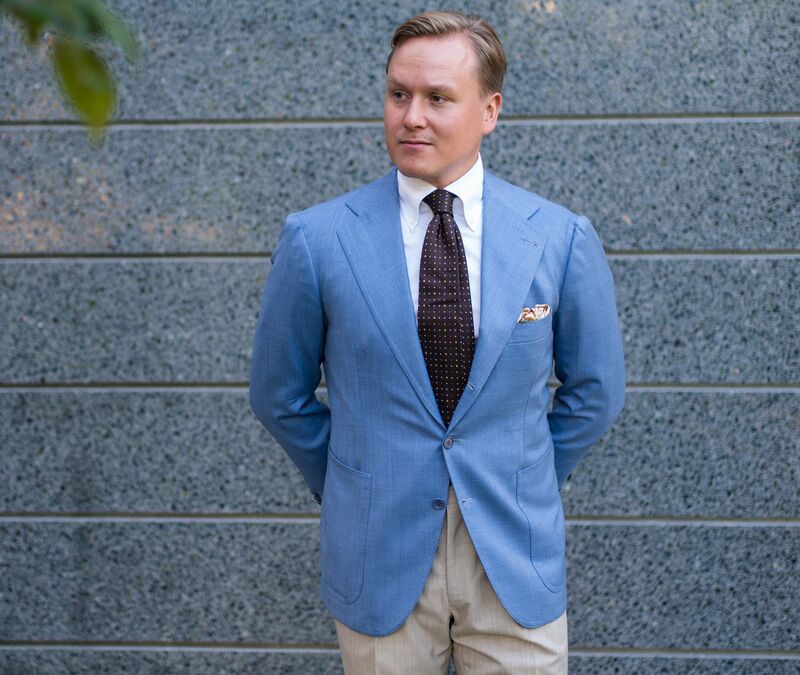 A light blue sport coat is not quite the wardrobe staple as the navy one is, but it's still a very timeless piece that is easily worn in a ton situations during summer time. 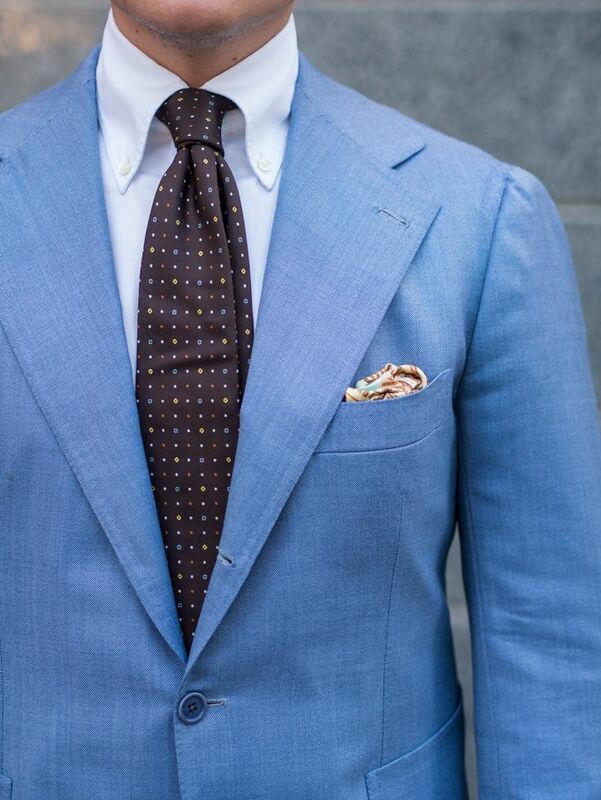 As with all pieces, the light blue sport coat comes in many shapes, forms and materials. 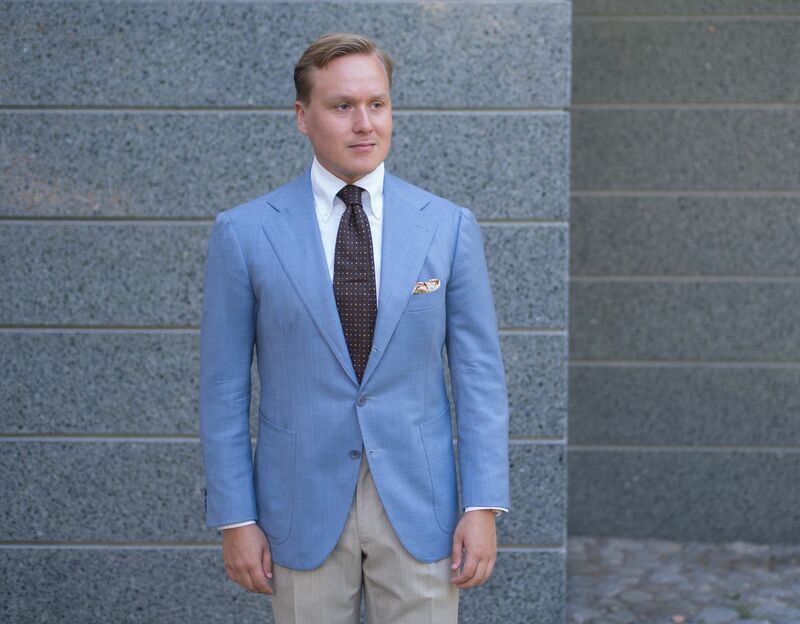 The most versatile model will arguably resemble my Sartoria Peluso all handmade sport coat seen in these picture, however. This jacket , originally made by Pino Peluso for himself, sports a very classic silhuette with fairly wide lapels and a Neapolitan shoulder. As with casual sport coats, the piece also comes with patch pockets. 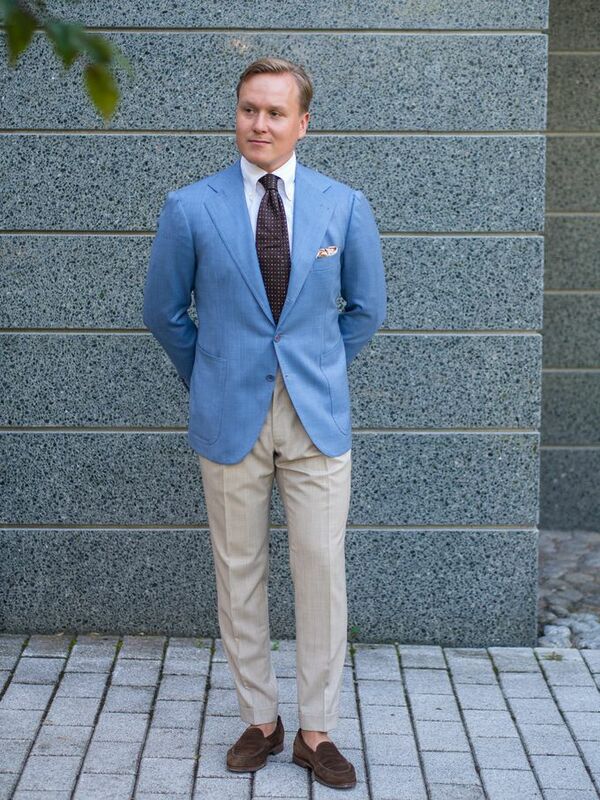 The fabric is a hopsack like airy wool fabric from an unknown mill (but probably Loro Piana). A light-colored sport coat such as mine here can be worn either with or without a tie. 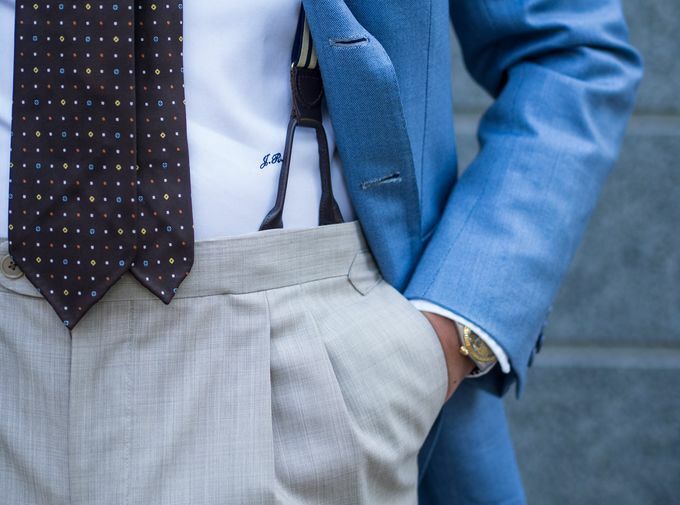 Depending on your choice it's advisable to choose your shirt to be on a similar formality level to your tie and then also choosing a ocket square that fits the general outfit. In this case I've gone for a more formal sport coat look, one that I might wear to a non client meeting day at work during summer time. A lightweight printed silk tie in very classic brown-orange-yellow-aqua colors combined with a printed silk pocket square in a complimenting brown-beige-orange-aqua tones. If I would not wear a tie, I would most likely choose a striped or light blue linen shirt and wear it with a few buttons open. 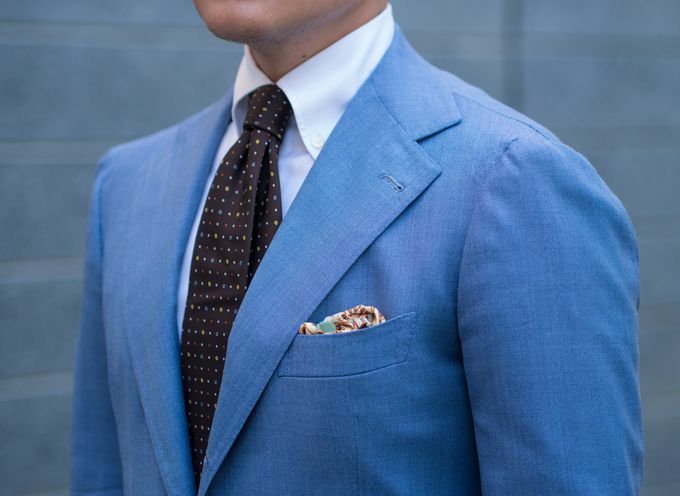 In this case a pocket square would not be totally necessary, but a more simple plain linen square would be the way to go. 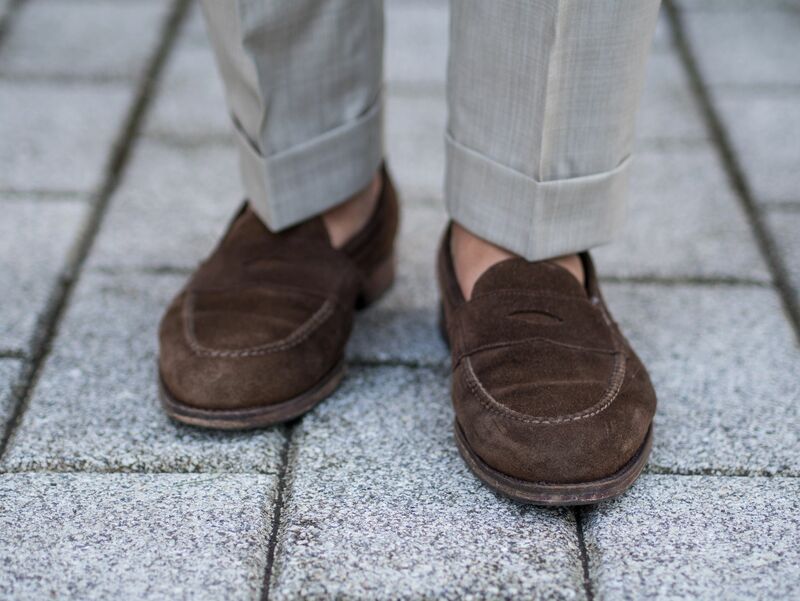 In general it is good to avoid very saturated and bright colors with a jacket that is already fairly colorful, this way you'll stay looking classic and avoid looking like a clown at Pitti Uomo. Other details such as your braces/suspenders, belt or watch are perhaps less important than the key accessories when wearing light blue. The most important thing is that you do not choose too matchy secondary accessories but also avoid using the above listed more challenging colors. You can probably imagine how bright medium green braces would look in the below picture. For shoes simply go with any classic summer choice that is in line with the general outfit. This outfit included my Sartoria Peluso handmade sport coat, Vaatturiliike Sauma mtm shirt and trousers, Exquisite Trimmings three fold silk tie, Rubinacci silk pocket square, Albert Thurston narrow elastic braces, Septieme Largeur suede loafers and my vintage Rolex Datejust.